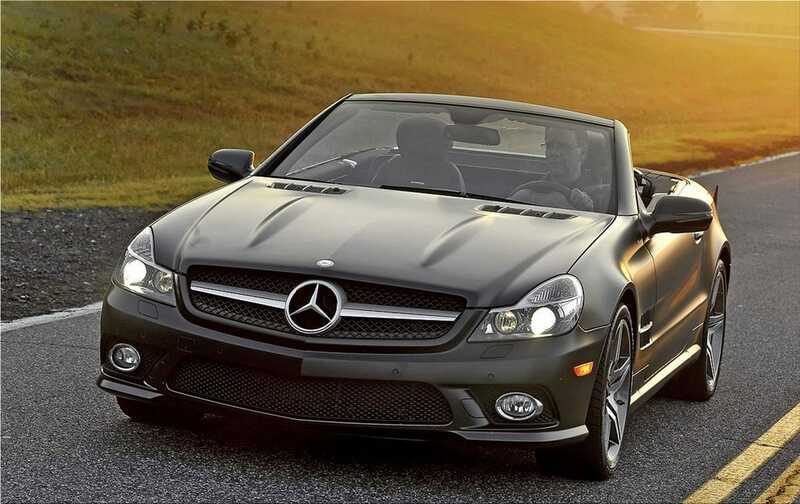 The 2011 Mercedes-Benz SL coupe/roadster line features the limited-edition SL550 Night Edition, which is painted in matte-finish designo Magno Night black with a black premium leather interior. Only 100 of this exclusive model are available in U.S. showrooms. Specially developed for the SL550 Night Edition, the designo Magno Night black paint highlights the dramatic lines of the SL body. The Night Edition is also identified by the two-tone finish of its 19-inch AMG five-spoke light-alloy wheels, as well as silver front brake calipers with "Mercedes-Benz" script and darkened headlights and tail lights. A striking contrast of dark black premium leather and bright chrome trim fills the interior, with the sports steering wheel, shift lever and roof lining trimmed in black. Newly-designed seats have eye-catching arrow-type stitching and contrasting silver accents, including the vents of the AIRSCARF® system, which bathes occupants' neck area with warm air in cooler weather when the convertible top is down. All 2011 SL coupe/roadster models now come with an enhanced tire-pressure monitoring system, HD radio and a satellite navigation system with SIRIUS real-time traffic information. Non-AMG SL models are also equipped with Direct Steer, which uses variable-ratio gearing in the steering rack to provide impressive on-center steering feel, with even higher responsiveness beyond the first five degrees of steering angle. A direct descendant of the legendary 300SL Gullwing of the 1950s, the current SL roadster line-up features the V8-powered SL550 (382 horsepower, 391 lb.-ft. of torque), the high-performance V8 SL63 AMG (518 hp, 465 lb.-ft.) and the V12-powered SL65 AMG (604 hp, 738 lb.-ft.). The latest SL roadster lineup features dramatic styling with fenders that incorporate sharp, angular headlights and modified gill-type air outlets behind the front wheels. A front hood with two power domes (AMG versions have a large, single dome) and a bold single-lamella grille emphasize the width of the body and make a symbolic visual connection to the famous 1954 300SL, while larger side mirrors reveal built-in arrow-shaped turn signals. At the rear, an air diffuser in the bumper adds a motorsports touch, and trapezoidal exhaust tips emphasize its width and suggest all the power on tap. The cockpit includes a three-spoke multi-function steering wheel and an instrument cluster with eye-catching red tachometer and speedometer needles that swing to the max position and back to zero whenever the ignition is turned on. The AIRSCARF neck-level heating system blows warm air from the head restraints of the driver and passenger seats, allowing occupants to cruise comfortably with the retractable hardtop open in cooler temperatures. Testing revealed that warming just a relatively small area around the neck dramatically improves comfort in cooler weather. Standard on the SL65 AMG model (and optional on the SL550 and SL63 AMG), the AIRSCARF heating system even compensates for changes in air temperature and vehicle speed. AIRSCARF uses a heating element made of barium titanate, which heats up in a matter of seconds when electrical current is applied. At the push of a button, the SL's retractable hardtop can be fully opened or closed in just 16 seconds, dramatically transforming the car from a quiet, weather-tight coupe to a top-down, open-air convertible. A hydraulic pump and 11 computer-controlled hydraulic cylinders power the system, and roof operation is controlled by a switch on the center console. Its folding "clamshell" design allows for a cargo area of 7.2 cubic feet when the top is down. With the top up, the trunk holds 10.2 cubic feet. Widely acclaimed as one of the world's safest convertibles, the SL provides sports car performance with all the built-in safety that's expected from Mercedes-Benz. Since an open car can leave its occupants vulnerable in a rollover, Mercedes engineers met the challenge in the SL with the world's first automatic roll bar. If sensors detect an impending rollover, the padded, leather-covered bar pops up, locking in place in a third of a second. It can also be raised or lowered by a console switch. Shoulder belts are integrated directly into the seats for greater occupant protection, especially in rollovers. The Mercedes SL was also the first car with side airbags, which are part of a Supplemental Restraint System (a phrase first coined by Mercedes-Benz) that includes dual front airbags and emergency tensioning retractors that tighten the seat belts in a collision. Excellent stopping power for the SL is provided by large, four-wheel disc brakes enhanced with four-channel ABS anti-lock control. The SL550 is equipped with vented 13.8-inch front and solid 12.6-inch rear discs. Matched to its power and speed capability, The SL63 AMG comes with even larger 14.2-inch vented rotors up front and 13.0-inch vented rotors at the rear, while the SL65 AMG boasts vented discs that are another 1.2 inches in diameter.